With 18 years experience in providing solutions to a wide variety of ergonomic problems across all industries and situations, it doesn’t matter what your seating issues are, AIRHAWK can probably provide the equipment or advice you need to resolve your problem. Whether you’re a medical practice or professional sourcing equipment, a professional driver or operator or an individual wanting to improve personal comfort and mobility the AIRHAWK Comfort Seating System is medically proven and essential for anyone who spends a long time sitting down. AIRHAWK uses Dry Floatation Technology - a series of interconnected air cells that mimic the properties of water that redistribute weight away from pressure points to improve blood flow, relieve discomfort and pain. 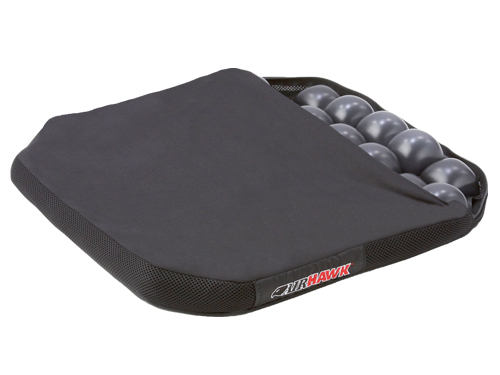 Each cushion can be fully customised to suit the shape and weight of the user. The desired air pressure is quickly and easily set by using the twist valve on the AIRHAWK Comfort Seating System. Absorbs vibration, shock and jarring reducing fatigue. providing a stable seating envorinment. AIRHAWK Comfort Seating System TPSNA for Truck and Heavy Machinery. 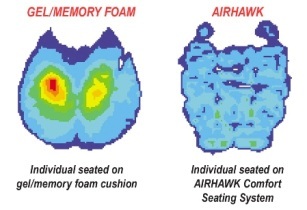 To find out more about AIRHAWK Comfort Seating Systems Contact Us or phone 1300 783 128.